Mike Morsberger’s job is usually getting potential donors to give GW millions of dollars. But at the Inaugural Ball, his biggest priority will be getting students to sing along with his rock songs. He will sing lead in a rock band called Deeds Not Words, joined by bassist and Center for Student Engagement director Tim Miller and Study Abroad director Rob Hallworth on drums. 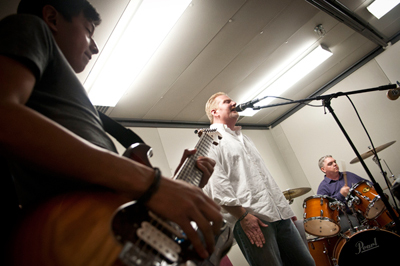 The three administrators will play soft rock covers from Top 40 bands like the Kings of Leon and Foo Fighters. They’ve practiced for fewer than eight hours. Director of the Center for Student Engagement Tim Miller plays in a band that gets regular gigs in Virginia. The group will play at about 9:30 p.m., sharing the Omni Shoreham Hotel’s Empire Room with a handful of student groups that will perform throughout the night. It is one of seven ballrooms for the more than 5,000 attendees. The performers come from lengthy and diverse musical backgrounds. Miller plays guitar for an acoustic band, which lands regular gigs in Arlington, Va. bars. Hallworth took up drumming at the age of 12 and has played in heavy metal, jazz and blues bands. Deeds Not Words also includes Matt Banks, a staffer in the Alumni and Development Office, and senior Art Wongchotigul, who will both play guitar. Morsberger said his wife will watch him belt out songs for the first time since he serenaded her in college and “scored the girl.” He’s more anxious about his two daughters, who will also watch the 30-minute performance, who are “half completely horrified” but also think it’s cool. Miller, who joked that his wife chose not to come after watching him perform at the 2009 ball, said that his only concern for the night would be finding parking. “If I can look out and there’s one person out there I can tell that’s into it, I’m happy. I can play in an empty room and still be happy, it’s just nice when people let me do it other places than my basement,” Miller added. Miller, who is on the Inaugural Ball Entertainment Committee, also played at the ball in 2009 and attended in 2005. He described the ball as an epitome of the GW experience. The performers aren’t concerned with competition for entertainment in the other six ballrooms, which include the dance groups Capital Funk and GW Raas, a cappella groups and a student DJ. As the only rock band, they feel pretty confident they’ll draw a crowd. But their rock n’ roll attitude isn’t without a touch of sarcasm. “If we don’t see Obama and Michelle in the mosh pit, we’re out of there,” Miller said.